Hawaii’s beaches and tropical weather often overshadows its lush, local farms, but, this weekend, the 53rd annual Hawaii State Farm Fair is sure to garner all the attention! The Hawaii Farm Bureau (HFB), State Department of Agriculture, and Hawaii 4-H Livestock Council is sponsoring the event, which will be held at Kualoa Ranch in Kaawa on Saturday and Sunday. Hours of operation are Saturday, July 11th from 9 a.m. to 8 p.m. and Sunday, July 12th from 9 a.m. to 5 p.m. This year’s event is called “Farm Family Fun!” and, for visitors looking for fun in Hawaii, it may be the ideal way to get a taste of Hawaii’s farming community at its best. It’s free for children and students with a valid student ID and just $5.00 for the general public. Free parking is available. The event is flush with a variety of entertainment options, including cooking demonstrations, contests like watermelon eating, pie find, corn husking, chili pepper eating and more. And, don’t forget to check-out the young up and coming artists who will be performing on Saturday. They include Crimson Apple, local artists, and recent Na Hoku Hanohano award winners for Group of the Year and Most Promising Artists, Huewa. Female acoustic artist Ashley Lilinoe will also be there. And, what farm fair would be complete with out a pie eating contest? Check-out the judging of the Big City Diner Best Local Pie Contest finalists on Saturday and presentation of the Ag-Challenge Winners on Sunday. If you’re looking to absorb some education while having fun in Hawaii, you can visit the numerous educational exhibits in the“Buy Local, It Matters” Education Pavilion. Local vendors and other agriculture related entities will inform, inspire and educate visitors about Hawaii’s local farming community. 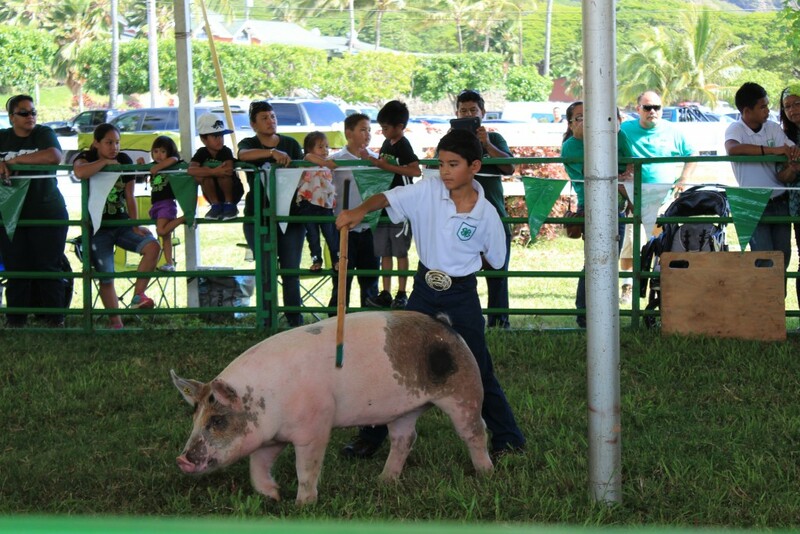 4H participants show off their livestock at the Hawaii State Farm Fair. You can also visit the 4H Livestock tent and watch various presentations by the 4H kids as they showcase their prize winning animals. “Keiki Farm Hands” is an interactive attraction that will educate children and their families about various aspects of farm life via hands-on experience. Begin at the GEICO start barn and make your way to the Seed I.D. and planting area where you’ll learn about the different types of seeds and get to plant one to take home. Then, head over to chicken incubator and coop with real live chicks and chickens. Collect an “egg” (fake) and move onto the garden harvest. Harvest veggies from your “crop” (of fake vegetables). Then, “mooove” on to experience milking a cow (A life-sized, hand-painted Holstein cow replica). Kids can also get “bee-zy” learning about honey bees from the Hawaiian Honey Bee Coop and UH Honey Bee project organizers. Finally, try your hand at working with kids sized farming tools. After the kids have spent some time experiencing farm life, they can turn in all their farm products to the Farmer’s Market where they’ll get a Hawaii Farm Bureau Buck. Use the dollar to buy a well deserved treat at the Seven-Eleven Country Store. When your kids are tired-out froma full day “farming,” take them to the Shriner’s Hospital’s For Children Teddy Bear Clinic. All day on both days, learn about being safe during the summer. Have your child bring his or her favorite bear, doll or stuffed animal to the clinic and register them as “patients.” Paitents will be treated by the Shriner’s medical staff and receive a certificate of completion. Hay rides are also available, as well as horse-back riding for older children. Plus, in the Kiddie Zone, you’ll find rides and bouncers to tire-out the little farmers! 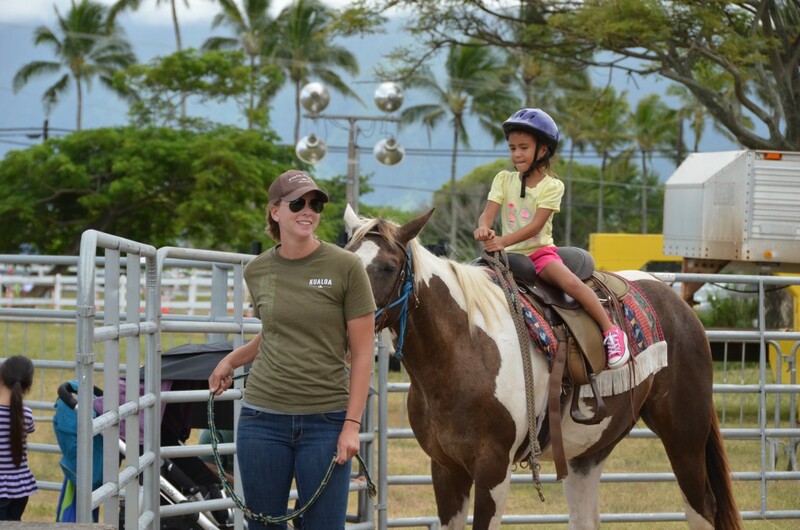 Horseback rides are available for kids at the Hawaii State Farm Fair. If you’re visiting Hawaii this weekend, be sure to take a break from the ocean and visit the Hawaii State Farm Fair—learning about Hawaii’s farm community has never been so much fun! Visit www.hawaiistatefarmfair.org for more information.